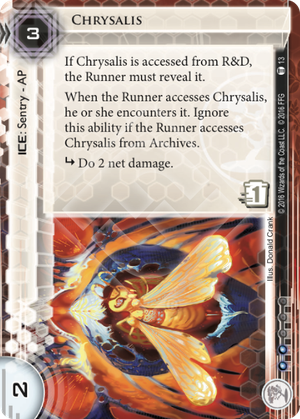 If Chrysalis is accessed from R&D, the Runner must reveal it. When the Runner accesses Chrysalis, he or she encounters it. Ignore this ability if the Runner accesses Chrysalis from Archives. subroutine Do 2 net damage. Can the Runner use Political Operative to trash a rezzed Chrysalis? Chrysalis is a piece of ICE that got a lot of buzz when it was first spoiled (Booo! Get off the stage!). However, it's been pretty quiet since the release of 23 Seconds. After all at the end of the day we're looking at a card that is basically 2/3rd of a Neural Katana for 3/4 of the price, and nobody even plays that card anymore! I think Chrysalis deserves a second look for certain Jinteki decks, even if it's numbers don't inspire pure worker-bee like devotion. Chrysalis is deck slot compression. Corporate decks need to include a lot of things to function. You've gotta have ICE and money and Agendas and upgrades, and you'll always be cutting something you want just to make it to 49 cards. Jinteki decks in particular have a deck slot demand that most other corps do not: 'Prickly' cards that punish the runner for access and thereby slow down or change their game-plan. I'm talking about Shock! and Snare! and the like. Just as Fetal AI is a 'prickly' card that doubles for your Agenda requirement, Chrysalis is a prickly card that doubles as an ICE deck slot. When you see Chrysalis in your opening hand you have two options: Install it as ICE or leave it in hand (perhaps with no ICE even guarding HQ) as a trap for the runner to wander into. Maybe you have enough other ICE you don't need it for the second option. Maybe you have no other ICE to threaten with and you NEED to install it so you don't get Siphoned turn 1. But just having that open-ended option in a single card is pretty significant. Long-time Jinteki players know that the best ICE in your deck is really anything that is still face-down. The runner can't afford to lose their hand to Komainu on the first turn! Chrysalis gives you that threat if you need it, with a side benefit if you don't. Chrysalis is pretty annoying to break. The difference between Strength 1 and 2 for Sentries is pretty important now that Faust is finally on the MWL. Powerful Killers like Alias, Mongoose, GS Shrike M2, and the upcoming Golden all need to pump their strength to break the subroutine on Chrysalis, and all of them end up over-paying to do so! If Criminal comes back into the meta this will be very relevant. It's a credit-free net damage trap from RnD or HQ. Account Siphoning your PE down below 4 credits for Snare! and hungrily guzzling down the multi-access events is a thing that certain decks want to do to defuse your big threats. Chrysalis fires off of no money and is a double-Shock!..! Runners have a lot of difficulty not peeking at RnD or HQ if you leave them un-iced on turn 1, and this effect is hilarious when they don't see any need to install their Sentry breaker early on. You honestly kind of miss Neural Katana, just admit it. Other corporations that have spent entire years importing Swordsman have discovered our secret: sniping the Runner's cards out of their hand is amazing. 2 Net damage is a lot more than 1, and while we must of course defer to the awesome net damage power of Komainu (the big Daddy Dogs of Jinteki Sentries) that 5 rez cost is very significant. 2 net damage for 3 credits is pretty excellent when you think about it, and the possibility exists that runners will see you dip just a few credits below the 5 you need for the Dogs and feel like they're safe. Mix up your ICE and show them that curiosity can still kill the cat. Unfortunately, we have to address the elephant in the room: Mimic. Once the runner has installed Mimic you are probably not going to want to waste your money rezzing this, and it becomes a mere 1-credit tax on the runner when seen from a central server (or 2 if they feel like trashing it). That's obviously a huge negative bullet point and is probably the entire reason we haven't seen a whole lot of excitement for this card past the initial spoiler. Another tough interaction is Political Operative, which it has been ruled can be used to trash any card with a trash cost, even Chrysalis once it has been installed and rezzed where it would normally be totally safe. I expect that's not a huge problem since usually Political Operative is being reserved by the runner to hunt important Upgrades but it's useful to know. In short, I expect the overall power of Chrysalis to be directly tied to the relative balance between Criminal and Anarch in the meta. If we start seeing more blue this gets some good value. However, even in a poor meta-state for it I believe that this ICE deserves some attention simply for the deck slot compression benefit it offers. PE loves having yet another card to zap the runner from RnD, and Chrysalis is at it's best in a deck that doesn't mind leaving one of it's central servers wide open for a long period of time. Other Jinteki decks that have traditionally had trouble squeezing in the dedicated deck slots for prickly cards may appreciate the ability to have their cake and eat it too here.